It’s a tough job to raise kids — and a tougher job still to juggle the responsibilities of parenting and working from home. There is no boundary, no “getting away” from your kids so you can focus on the tasks at hand, you can’t set office hours in the normal sense, and kids seem to have a sixth sense as to when you’re on an important phone call. I don’t claim to be an expert, but in a moment I’ll share ten tips I’ve learned over the past three years while mothering a child and working at home. Balancing my work with the art of mothering hasn’t always been easy, and I admit I’ve had my off days. But overall, life is good. I get to spend the day with my child (soon to be two! ), and as time permits, continue working at the job I love – photography. Set boundaries – even though I don’t have to work set hours, I’ve found it is essential to put limits on when, where, and how much work I am willing to do on any given day. When my son was an infant, I discovered it was indeed possible to multi-task. Nursing sessions became chances to catch up on emails and edit images, naptimes were golden opportunities to get a lot of work done. Now that my son is a toddler, we still have naps from time to time, but those are unpredictable in frequency and length of time. Set a Timer – Having a finite, tangible “end” to work time is really important for kids. If you use a timer at all for time outs, you can explain that this timer means “work time is done” when it buzzes. Amusingly, my son has taken to setting an imaginary timer in his play kitchen when I use this technique. But it works! Plan Activities – One surefire way to get some quiet time to work is to provide age appropriate activity suggestions for your toddler, such as reading books, “working” on a learning laptop, or doing an art project. One day, my son spent an hour “washing” dishes at the sink, and I was able to work on my laptop at the kitchen table. Yes, we wasted some water, but it was worth it. Invite grandma or another relative to play – we’re fortunate to have much of our family living nearby. Grandparents in particular are often happy to oblige requests, sometimes on short notice. Plus, if your child is the one who calls and asks, relatives get the pleasure of a nice phone conversation, and your child will be practicing valuable phone skills. Late to Bed or Early to rise? – After my son’s bedtime is often when I feel very productive, so I’ll get to work at that point. Or, if I’ve had a long day and I’m tired, it’s off to bed for me so I can have a chance at waking early to get some work in before the house starts bustling. Just make sure not to burn the candle at both ends. You need sleep to function, and if you are tired and cranky, your day is not going to go too smoothly. Say what you mean, and do what you say – As a parent, I want my son to trust me implicitly. I want my word to mean something. So I put a lot of effort into doing what I say I will do. This goes for time outs, consequences, and promises to stop working in 5 minutes. I also have tried to strike the phrase “just a minute” from my vocabulary. All too often, it’s used as an open-ended “not now” or “not yet” blow-off answer. It’s the whole golden rule concept, right? I don’t like it when others don’t follow through, so I need to follow through myself. But I’m not perfect. Sometimes I get so caught up in the work I’m doing that I forget to keep my word. Then I try to use that as a learning opportunity; through my apology and explanation, my son can see that he isn’t the only one who struggles with keeping promises. Don’t forget grace – Not the kind you say at meals, but the art of compassion. You are a mom, you are a professional. As I tell my son, everyone deserves a little grace. Whether we’re on the giving or receiving end, grace is a powerful tool towards reconciliation and peace – and it can be used to diffuse seemingly impossible situations. Keep Things in Perspective – wearing so many hats can be stressful, frustrating, and draining… especially if you lose your perspective. Don’t get so caught up in what you could be doing that you forget to enjoy the moments at hand. Life is too short to have your attention focused elsewhere. Be content with where you are, what you are doing, and who you are – right now – as a mother and a person. You deserve it. Oh, and I forgot to mention one thing. Sometimes it’s necessary to get creative. You may not be able to have a home office setup, but that doesn’t mean work won’t get done. You can put together a portable office binder, or designate a corner of the kitchen for your work area. Being a mom and working from home means accepting imperfection, finding contentment in the journey. Sometimes important papers will get accidentally cut into pieces as an exercise in scissor skills by an excited toddler. Sometimes the power button will get pushed on your computer when you don’t want it to. Speaking of which, set your computer to “lock” when you get up for any reason… little fingers can’t resist an unoccupied keyboard. What does it all come down to? Learning to live with what you’ve been given. Life is a balancing act that encompasses both my identity as a mother and my identity as a photographer. There will always be give and take, but for our family, at least, the benefits of working from home as a parent outweigh the drawbacks. I hope that if you’re feeling overwhelmed these tips will help you regain that sense of balance and normalcy that we all crave. 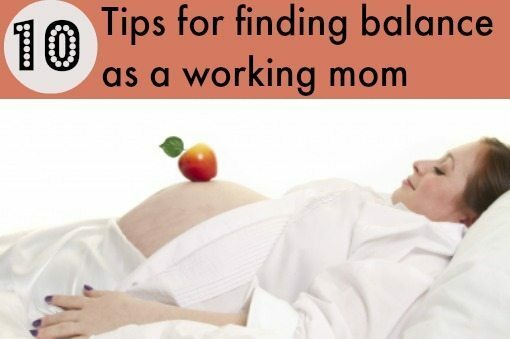 Here’s to motherhood and finding the balance that works best for you! Betsy Finn lives in Michigan with her husband, (soon-to-be-two) boys, and two cats (Betsy's story). You can read more of her thoughts on life and creative musings at BPhotoArt.com. There, Betsy blogs about a hodgepodge of topics including fine art and portrait photography, parenting, capturing memories, and finding contentment in the journey of life. You can also find Betsy on Facebook,Twitter,Google+,Pinterest,and Instagram. I should print this out and place it in every room of the house..
Great tips Helen! Thank you so much for sharing! You are such a good parent. These are fantastic tips. Mine usually involve having too much to do and letting them play on the games console with an ice-cream so I can just do that important piece. Some great tips, I only take on a little freelance work, and even that can be a juggling act with a two year old in the house!